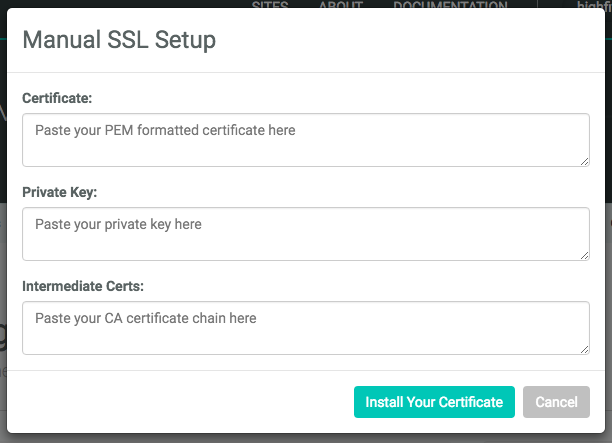 Netlify offers free 1-click SSL with LetsEncrypt. It’s the very definition of easy. But some of our customers have reasons for using their own certificates procured from an SSL Certificate Authority. If you are one of those customers, we’ll show you how to install your own certificate here. Log in to app.netlify.com and choose your site. First, make sure that your custom domain has been set. The domain name of your site must match the domain name on the SSL certificate. Next click SSL at the top of your page. Then click the button labeled Provide Your Own Certificate. Copy the bottom portion, beginning with the first dash of the Begin Certificate line and ending after the last dash of the End Certificate line. Paste the selection in the Certificate box at the top of the popup. Next, copy your Private Key. Begin with the first dash of the Begin RSA Private Key line and ending after the last dash of the End RSA Private Key line. Paste the selection in the Private Key box. Finally, you’ll need to paste in your intermediate certificate chains. The availability of these chains depend on certificate provider you’ve chosen. If you choose to install your certificate without adding in the Intermediate Certs, be aware that while it may appear to work in your browser, it could break when trying to access your site through a mobile interface. It’s worth noting that if you install a certificate on your domain, with wildcards, for example *.example.com, you will be the only one with the ability to install a separate certificate for a subdomain. Other users on your admin account will be unable to add certificates or set custom domains for subdomains without specific authorization. Once you’ve filled all the fields in the popup, just click Install Your Certificate, and your site is secure.